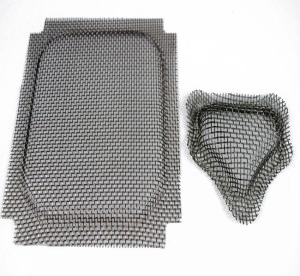 Stamped Wire Mesh Parts | Welcome to Hillside Wire Cloth Co. Stamped wire mesh parts are custom fabricated to exact customer specifications. Orders are typically completed in few days at economical pricing. Typical applications for stamped wire mesh parts include petroleum, chemical, food and mineral industries. Please use the form below to send us your specifications for Stamped Wire Mesh parts and one of our Specialists will contact you to discuss your custom design. Please enter the specifications you require for your Stamped Wire Mesh Parts. You may use this form over again for a additional Stamped Wire Mesh Parts custom order quotes. Our sales team will receive your inquiry and contact you directly to assist you. A Stamped Wire Mesh Parts Specialist from Hillside Wire Cloth will contact you once we receive your inquiry to work with you personally to ensure your Stamped Wire Mesh Parts are designed perfectly to your exact specifications.